Grigorovich production will be shown in more than 1,000 movie theaters. The Bolshoi Theater has announced that the ballet Ivan Grozny will be broadcast on April 19 in movie theaters in Russia and around the world as part of the theater’s 2014-2015 season. "The following year the ballet was staged at the Paris Opera, where it was received with great enthusiasm, and soon it was shown during the summer season at a special stage in the Louvre," said Grigorovich. The Bolshoi showed the ballet until 1990, staging it a total of almost 100 times. The theater has performed the ballet another 100 times during tours of France, Germany, the UK and other countries. The new Grigorovich production, which will be shown in movie theaters, was introduced in fall 2012. 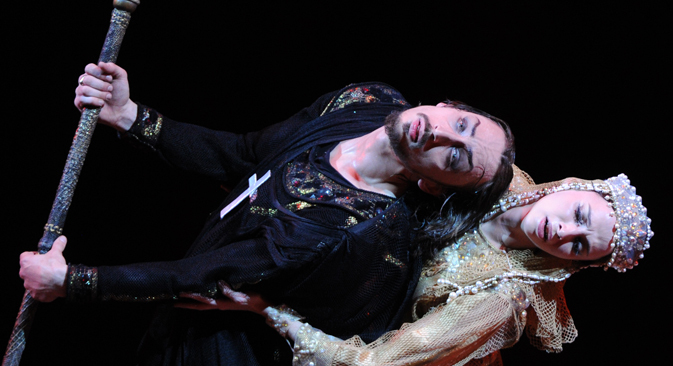 The leading roles include Bolshoi soloists such as Mikhail Lobukhin, Anna Nikulina and Denis Rodkin. Russian internet users will have online access to the transmission through the Bolshoi's YouTube channel. The ballet will be broadcast in more than 1,000 movie theaters around the world thanks to Pathé Live. Other locations in Europe and Asia.